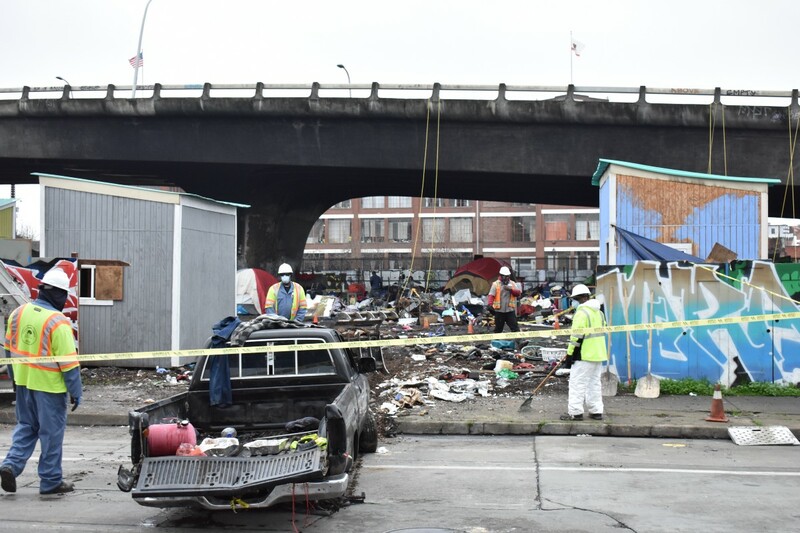 The scene at E.12th homeless camp on early Thursday morning, Feb. 7, as Oakland city workers start the long process of clearing out the location. 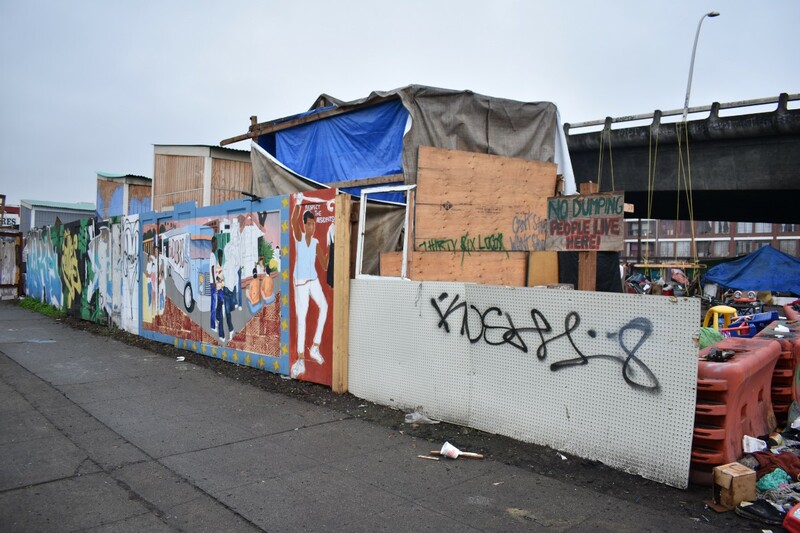 Residents of tents and other temporary shelters found themselves on the streets once again, after the City of Oakland evicted the homeless encampment formerly located at the corner of East 12th Street and 23rd Avenue over the course of two weeks starting Jan. 31. 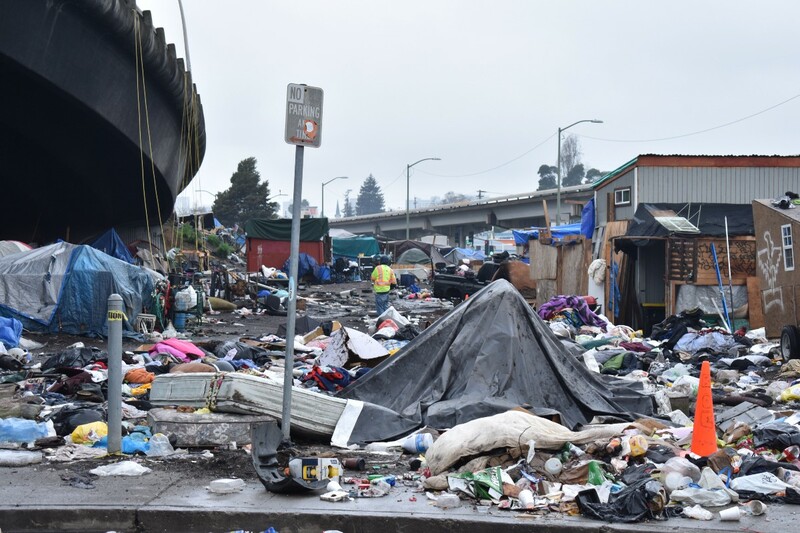 The City planned to relocate the estimated 39 residents from this encampment to the Community Cabins, or “Tuff Sheds,” located at 1449 Miller Ave., said Joe DeVries, Oakland’s assistant to the city administrator and chief privacy officer. However, Needa Bee, an organizer in Oakland’s homeless advocacy group, The Village, said that the number of people at the location was actually at least 56 and as high as 70 at times and, consequently, there were not enough shelters for everyone displaced. The first morning, residents were awakened by Public Works dump trucks and police at 8:30 a.m. and instructed to gather their belongings into crowded shopping carts, suitcases, and vehicles. “This whole situation of evicting and destroying peoples homes is only causing more homelessness,” Kaleeo Acatarn said. Acatar was living at the East 12th Street encampment with his mother. Now, he plans to help his mother go to a rehabilitation center, while he crashes with friends, he said. The Miller Avenue Tuff Shed cabins are the city’s third temporary housing location, after the location at 27th Street and Northgate Avenue and the camp across from Laney College at 10th Street. While some displaced residents were able to stay at the Community Cabins, others moved a few blocks down to a freeway median on 17th Street, while some did not know what lay ahead. Resident and former Laney cosmetology student Melinda Mean, who did not find space in the new cabins, said she and her husband were hesitant about applying. “We aren’t sure how we feel about the shed’s [Community Cabin’s] rules not to bring all of our stuff. I don’t know if I’ll get along with the staff either,” Mean said. Further down East 12th Street, people could be seen setting up tents and moving their belongings to 17th Avenue. One of these people, known as Lihn, had been living at the East 12th Street encampment for three years. “They told me there was no more space in the sheds [Community Cabins],” Linh said when asked why she relocated. The City of Oakland stated that the Community Cabins offer linkages to healthcare, mental health, and addiction recovery services. Deborah Cornelius and her husband lived at the encampment on East 12th Street, which is the same neighborhood that she grew up in. During the eviction, they were moving belongings to a family member’s house, because they had limited space at the cabins, she said. “They [staff at the Community Cabins] helped us get medicare, food stamps, our ID’s; they usually give us three meals a day, and they drive us to our medical appointments if we need it. But I really couldn’t have done it without my husband,” Cornelius said. The solution to homelessness is not as simple as providing housing and services. There needs to be stability as well, Acatar said. “Most of the times, with the city you can see there’s no real effort to work with somebody. You can house someone for a few months, and they’ll be out in the street again. It’s not just the physical. It’s the mental, the spiritual. If you really want to cure homelessness you gotta go deep,” Acatar said. 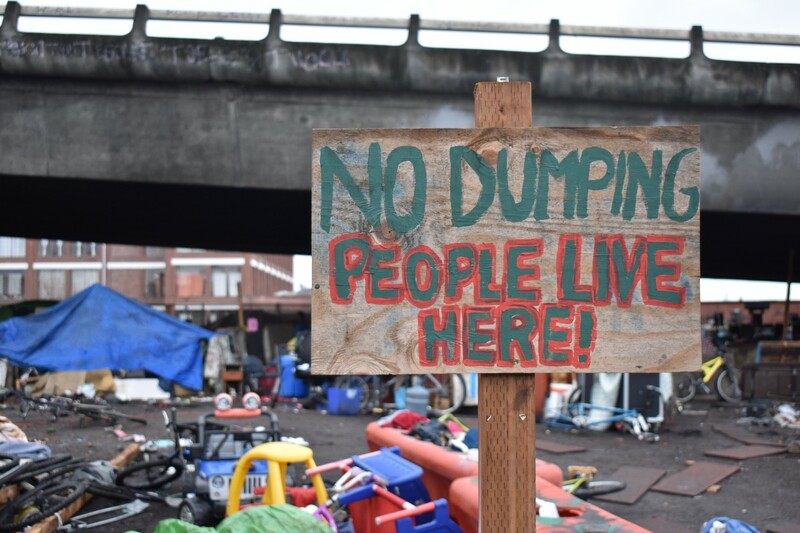 Residents of two other Village-organized camps, located at Marcus Garvey Park and The Housing and Dignity Village at Edes Ave. and Clara St., were evicted in 2018. “Imagine if all homeless folks got together and started moving as one and speaking as one. Even the organizations moving as one,” Acatar said. “That would be a powerful movement that not [Oakland Mayor] Libby Schaff, not even Donald Trump could stop. It could stop homelessness,” Acatar said.